Can-Am Spyder Touring | The greatest WordPress.com site in all the land! There are two modifications that must be made to a normal automobile GPS to facilitate and greatly improve the use of that GPS on a motorcycle. The first is the addition of an audio out (female) plug into which the helmet headset earbuds can be inserted, or into which earbuds can be used, sans helmet. The addition of an audio out jack is covered in a separate article in this blog. See “Audio Out Stereo Jack – Nuvi 55LM”. The second is to add a sun shade so that the GPS screen can be viewed while exposed to the bright sunshine on a normal tour. That second modification will be detailed in this article. The first challenge of adding a shade to the Nuvi 55LM GPS or any other GPS model is to find a material that is flexible enough to bend around the corners of the Ram Mount holder that is used to mount the GPS onto the handle bar of the motorcycle yet stiff enough to withstand the environment of the ride. After searching hobby shops and hardware stores a very bright employee of a hardware store recommended that a strip of Rubber Wall Cove Base would satisfy the requirements of this project. The Rubber Wall Cove Base is essentially a four foot length of a rubber (likely plastic) sheet approximately four (4) inches in width. There is a bend on one side of the strip that must be removed, that bend providing a tight fitment to a tiled bathroom floor where this item is normally used. In the wooden format this item is used as a finish molding between the flooring material and the wall of homes. The picture above shows the several items purchased for this project. The black Wall Cove Base in the photo shows that item before the angled bottom has been removed. That angled edge must be removed simply by cutting it off using a sharp blade and straight-edge to achieve a straight edge. The nails will be shortened to fit through the outside of the shade through holes drilled into the GPS holder to help secure the shade to the holder. The glue will be used to secure the nail heads to the outside of the shade. These shortened nails simply hold the shade in place rather that attach (it) to the GPS holder. The paper template shows the general design of the shade with straight top and curved sides with a narrow strip around the bottom of the GPS holder. The glue is required to hold the brads in place around the perimeter of the GPS holder, brads made by cutting short pieces of the brads (small nails), also pictured. The picture above shows the cutout of the Wall Cove Base material using the template and a sharp pair of scissors or shears. Note the two small holes punched into each end on the narrow end strips that will be used to hold a spring that will hold the shade in a tension-ed situation. The small spring above the shade cutout is not the final spring but a spring used during the fitment of the shade to the holder. Initial tests of the shade bent around the GPS holder indicated that the material did not bend well around the 90 degree corners. In order to ‘weaken’ the material at each corner a soldering pen (gun) can be used to score the bend sufficiently to allow a 90 degree bend to be achieved. Be extremely careful in this scoring to avoid cutting into the material too deeply, thus damaging the material resulting in a tear! Using a non-combustible straight-edge to provide a perfectly straight cut! The GPS holder has a patented attaching roller in a tang that allows the GPS to be ‘snapped into’ the holder. This mechanism is much too stiff (in my opinion) for its intended use so it should be removed using a Dremel drill cutting attachment or similar device. Removing the ridge (not shown) on the top surface of the tang will ease the stiffness of the tang allowing an easy, yet secure placement of the GPS device into the GPS holder. The picture above show the attaching roller removed from the GPS holder, a modification that does not inhibit the holder’s snug fitment of the GPS while making the insertion of the GPS into the holder much easier, avoiding any damage to the GPS device itself! The picture above shows the bottom of the shade after mounting the shade onto the GPS holder, bending the shade at each of the corners, and using plastic ties to install a stronger spring between the two ends of the shade. The plastic ties allow the spring to be tension-ed sufficiently to hold the shade in place. The picture above shows the GPS shade mounted onto the GPS holder with the short nails installed across the top of the shade and at the bottom corner on each side. A hole is drilled through the shade and the holder into which a nail is inserted, that nail shortened so that it does not extend through the hole and damage the GPS device itself. The spring tension-ed at the bottom of the shade is not sufficiently strong to prevent vibration and wind from dislodging the shade from the holder without these additional, securing points. The picture above shows the finished shade installed onto the GPS that is mounted onto a Ram Ball Mount on the handlebar of the Spyder ST. The Ram Mount component that is mounted onto the handlebar is actually designed for the yoke of an airplane.. note the angled fitment of that mount. Note also the coiled attaching charging wire running from the GPS to a 12Volt female jack in the side of the Spyder ST, an addition shortly after the ST was purchased. One would think that with all of the motorcycle touring enthusiasts out there that one of the GPS manufacturers would provide an inexpensive GPS device with both an audio out jack and a sun shade … but they don’t. Those of us (riders) who depend on the voice commands from a GPS device guiding our tour with only an occasional actual look at the screen of the device would surely be willing buyers of such a device! I can’t count the number of times the voice commands from my GPS device mounted on the handlebar of my Can Am Spyder has guided my path safely through complicated and unmarked intersections on unfamiliar roadways! The NUVI GPS identified in this article is actually overly complex in terms of the features that it provides. As a motorcycle tourer my trip planning involves identifying each of the towns that I will travel through noting those towns where I will have to stop for fuel. The best GPS s allow me to identify those towns, sans any street address, in a list (of favorites?) that I can select from as I make my way along the chosen roadways. Older GPS s allowed me to assign a name to each favorite city name selected so that I could arrange those names in the list in order of their position on my trip, not based on the actual alphabetical name of the actual town. The favorite list became a list of city names in order of their position on my trip. My technique is to select the next way-point city (favorite) several miles before I’m directed to the ‘city center’ of the current selection. That early selection normally directs me either around the current favorite to the selected, next city. All of this may seem to be overly complicated but having the ability to select the next city to pass through as that next city is approached is handy indeed, and will normally take me around the upcoming city rather that some route through the ‘center’ of an unfamiliar city. A search of the Ram Mount® website revealed that there was not a specific holder available for the Via 1425M GPS device. A holder is absolutely required to safely secure the GPS to the handlebar of a motorcycle. I had purchased two identical holders for the (old) XL350TM GPS that the Via 1425M was replacing so I had an ‘extra’ holder. These two devices were exactly the same size so the extra 330 Series model Ram Mount® holder would hold the GPS securely but the on/off switch and access to the micro-USB connector were not accessible. The image below shows the rear of the Via 1425M alongside the 330 Series holder. The image above shows the upper left side of the holder with a cutout to the existing open area of that holder extending above and around the on/off switch of the Via 1425M to allow access to that switch while the GPS is mounted into the holder. This simple modification was made using a grinding attachment on a Dremel tool with sandpaper smoothing the cutout. The image above shows the lower right-hand side of the 330 Series holder with an elongated opening drilled and cut to allow access to the micro-USB connector of the GPS. The elongated opening is required to allow the 90 degree male connector of the charging/updating wire to securely connect to the GPS. The image above shows the holder with the GPS mounted inside to determine if additional shaping of the initial hole is necessary. Attempting to plug-in the micro-USB male end of the charging wire was unsuccessful so the size of the initial hole needed to be expanded, to the left. Additional work using sanding paper cleaned up this irregular hole. The image above shows the 90 degree male end of the charging wire inserted through then enlarged access hole into the female micro-USB jack in the back of the via 1425M. The image above shows the completed holder modification with the female jack wire passing through a hole drilled in the upper right corner of the back of the modified 330Series holder. The TomTom Via 1425M GPS is now ready to be mounted to the handlebar of my motorcycle to replace the XL350TM recently retired because the maps on that GPS could not be updated any longer! During a recent update of the maps stored in my TomTom XL350TM GPS a warning message was displayed prior to that attempted update indicating that this particular model would no longer be updated with current maps because there was not sufficient memory to hold the most recent maps… a disappointment but after almost six years of frequent use of the XL350 it was time for a replacement GPS. After browsing the internet for a comparable GPS I settled on the TomTom Via 1425M model, a GPS of the same features, size and body shape as the XL350TM that it would be replacing. This new model has a slot for a memory card so I purchased a 32GB micro memory card to avoid any chance that this newer GPS device will ever suffer the same fate as the GPS it replaces. The first step in adding an audio out jack to the 1425M is to (carefully) open the case to expose the wiring to the speaker. This is accomplished using the same set of tools that I obtained prior to performing the same case opening on the XL350TM almost six years ago. Those tools consist of a micro-sized torx screwdriver and a soft plastic prying tool with a curved end. There are numerous videos on YouTube that show the procedure to open the case of similar GPS devices…. Just be very careful so as not to damage the closures that will securely hold the front and back parts of the case together at the completion of the modification! The image above shows the case of the Via 1425M after the case has been opened. There is a fragile flat connecting cable at the bottom inside of the case so I placed two pieces of tape around the bottom to hold the two sides together, acting like a flexible hinge, to avoid any possibility of damage to that cable. The image above shows the top side of the open case with a plastic scrap just long enough to hold the case open to provide access to the speaker wires, the red and black wires located in the lower right inside of the case. Note that the speaker wire connector to the circuit board of the GPS has been carefully disconnected using tweezers to allow the wires to be raised above the circuit board for stripping of the insulation from a short length of each wire. The plastic insulation has already been removed using a soldering pen in conjunction with an exacto knife to soften the insulation and push it away with the blade being VERRRRY careful not to damage or cut any of the stranded wire inside. The image above shows the two wires that will be soldered to the speaker wires, passing through a hole located in the corner of the case. The black covering is shrink wrap tubing to both hold the wires together and protect the wires where they pass through the case. The easiest way to ‘drill’ a hole through the case is with the hot pointed tip of a soldering pen. A separate soldering pen is used for this ‘drilling’ since the melted plastic contaminates the tip making it unsuitable for actual soldering! The collar near the upper end of the two wires is created using multiple layers of the same shrink tubing, with each cut to the same length and then shrunk to a tight fit using a very hot hair dryer. That collar will prevent the wires from being pulled away from the connection to the speaker wires, accidentally! The image above shows the two wire extension to the speaker wires soldered to each of the speaker wires after each of those speaker wires has been ‘tinned’ with solder for a strong soldered connection. After this soldering has been completed and verified as a quality connection the wires are first insulated from each other and the circuit board with small strips of black electrician’s tape and then pushed down toward the circuit board so the speaker T-connector can be reattached to the female connector on the circuit board. The image above shows the (female) stereo audio out jack attached to the two-wire loom that passes through the case of the GPS. Note that the green wire is attached without solder at this point to the grounding connector of the audio out jack while the individual small wires inside the red wire from the monaural speaker have been split to connect to both of the stereo connectors of the audio out jack. This will cause the same audio to be fed to both earbuds of my motorcycle helmet for a ‘faux’ stereo effect. The image above shows the stereo audio out jack after soldering and assembly of the protective cap/closure over the metal jack. The GPS is now ready for mounting onto my motorcycle handlebar using the modified Ram Mount cradle modified to fit this model of the TomTom GPS. Just over a year ago I decided that I needed a new rear tire on my 2013 ST Can-Am Spyder. With just over 12,000 miles of wear on that tire it was clearly near the end of its life! I had read several articles on the internet that verified that the rear tire on this motorcycle was short-lived.. i.e., unlike 4-wheeled vehicles that will get 40,000+ miles even on budget tires. So, in the absence of any experience with changing a rear tire, or any tire for that matter on a motorcycle, a year of living without an operating motorcycle began! I did actually visit a Can-Am dealership to obtain information on the cost of replacing the rear tire… and the least expensive one quoted something over $500 as a starting point. My motorcycle has a trailer hitch installed (by me) so the labor cost to both remove and replace that hitch obviously would increase the estimate. Further, only an OEM tire would be available from the dealership because Can-Am does not allow any other brand of rear tire under the warranty of this motorcycle. Having to repeat this expensive procedure after only 12,000 more miles seemed to eliminate this option. The next several months presented a series of challenges! Before I actually bought a new tire I spent several hours viewing YouTube videos of other motorcycle owners changing the rear tires of their Spyders. I suspect that most of these videos provided were experienced mechanics because they made the process look so easy that I was convinced that I too could do the deed! None of these ‘shade-tree’ mechanics replaced the tire with an OEM brand but used one of two or three automobile (racing) tires instead. My first step was to obtain a replacement tire. After checking for the size of the rear tire at several local tire stores I decided to order one over the internet… a tire brand that several Spyder owners had recommended in their blogs. One of the videos of tire replacement had indicated the need for one large, metric socket to remove the nut of the tire axle. Fortunately I had a PDF version of the shop manual for my motorcycle that correctly specified the size of that socket. Rather than use pliers on the opposite side of the axle I ordered two 36mm sockets for that part of the removal procedure. The exhaust does not have to be removed at this time but it might as well be since it definitely needs to be out of the way during the caliper brake reinstall procedure. After removing the bolt holding the trailer hitch and removing that hitch and associated wiring loom I removed the two bolts holding the caliper brake in order to drop that caliper off the rotor, and out of the way. For my caliper brake there was a shim washer between the brake and the support that fell to the garage floor when I removed the rear bolt.. be sure and replace that shim washer when you replace the caliper assembly! Support the (hanging) caliper brake with a cord of some type (I used a bungee) to prevent damage to the several lines connecting the caliper to the frame of the motorcycle. Support the rear of the motorcycle with a floor jack located as close to the rear of the motorcycle as possible. Remove the drive belt by carefully prying it off of the rear sprocket. Do NOT under any circumstances change the settings of the two bolts on each side of the rear frame (swing arm) that control the position and more importantly the alignment of the rear wheel. Carefully pull the rear wheel off of the frame. The rear license plate and hardware may also need to be removed for clearance from the tire. My motorcycle has custom fitted (by me) mudflaps to prevent the rear tire from ‘slinging’ water and mud onto my trailer or to the back of my jacket during foul weather rides! These also had to be removed. The next step is changing the tire on the rim. While most tire shops will change the tire for a small fee they are not able to balance the new wheel / tire combination because of the size of the center hole in the motorcycle’s wheel and the type of balancing weights used on rear motorcycle wheels. You will have to find a motorcycle shop (non Can-Am) to perform the balancing procedure, again for a (small?) fee! After all that had been completed I was then challenged to replace the wheel with my brand new high mileage tire! All of the bolts and nuts removed during the removal of the rear wheel have to be torqued to very specific tightness’s as specified in my shop manual. I had sold my torque wrench years ago so I had to purchase a new one for this one time job… another unexpected / unplanned expense! The trailer hitch and trailer lighting loom could now be reinstalled. I had originally installed the hitch so the process was familiar and fairly simple. My initial efforts to reinstall the rear Caliper Brake were a total disaster… No matter how many times I tried I could not get the Caliper Brake reinstalled. The basic problem was that the space between the brake pads was no longer wide enough to clear the rotor as I tried to lift the caliper brake up onto the bottom of that rotor. Initially the two pads were too close together to clear the thickness of the rotor. Next, the exhaust was in the way (see note above) so the exhaust had to be removed. Two bolts holding the exhaust pipe to the lower exhaust pipe were extremely difficult to remove due to their location and the type of OEM bolt head. Note that the two bolts for the exhaust were replaced with new bolts as well as the two bolts holding the caliper brake in place per instructions in my shop manual! Even with the exhaust removed to provide easier access to the rotor the pads of the caliper brake had closed enough to prevent them from clearing the rotor in my initial several attempts to replace the caliper brake. At this point without any apparent technique for replacing the caliper brake I went into a procrastinating holding pattern with respect to any further attempt to complete the rear tire replacement project… my touring was clearly on hold! After literally several months of avoiding confronting what seemed to be an unsolvable problem I finally got off my behind and re-entered the fray of a un-assembled motorcycle! A review of the YouTube videos available finally revealed that the pads needed to be removed from the caliper brake so that the piston of the caliper could be pushed / screwed back into a seated position. Using needle nosed pliers opened so that the points of the nose could be set into the two holes of the front of the piston and turning in a clockwise direction while pushing toward the piston that piston can be reset into a totally open position. You know you have reached the completely open piston position when the piston no longer moves into the piston chamber. The pliers used in this way avoided having to purchase another (single use) tool for resetting the piston to full open. This helped but did not allow the caliper to be replaced onto the rotor! The problem I had was that the pads would move / flop out their open position as I lowered and inclined the caliper brake in order to clear the wheel / rim while trying to position the caliper so that the pads cleared the rotor. The pads simply moved (together) every time I tried. I needed some way to hold the pads into an open position while I positioned the caliper. It was a real challenge. Don’t ask me how I came up with the solution but here it is! I used four (new) wooden pencils to solve the problem! Each pencil was positioned between the two pads by pointing the (unsharpened) end into the space between the pads with the (eraser) end pointing outside at an angle upward from the caliper pads. Each of three additional pencils were located on top of the first one, in turn, again at an upward angle so that the four were now securely holding the two pads open sufficiently to clear the rotor. As I positioned the caliper at an angle (to clear the wheel) underneath the rotor the pencils held the pads in place so that they cleared the lower rim / edge of the rotor. As I moved / pushed the caliper upward to touch the first (lowest) pencil I pulled that pencil out of the space between the two pads again moving the caliper upward until it touched the next pencil… and so on until all pencils were removed and the caliper was FINALLY in place, ready to be bolted into place using the new bolts and blue Loctite. Note that there was a spacing washer between the back bolt and the motorcycle frame that fell out during removal of the caliper brake… that washer having to be replaced, carefully back between the caliper and frame as the bolt was reinserted in the rear hole of the caliper brake. With the caliper brake mechanism finally reinstalled the several parking brake connections as well as the exhaust were re-installed and a test ride verified that everything had been correctly re-installed. Note that the parking brake should be off so that the connector at the brake arm is positioned rearward when the brake cable is reconnected to the arm of the Caliper Brake Assembly. After a test ride any wear on the inside edge of the drive belt should be noted and a realignment made to the back tire if that occurs. Thankfully after several short test rides no such wear has been noted! Continue to check all bolts / nuts for tightness and note any mis-alignment of the brake pads after subsequent short test rides. This likely is my LAST ‘Shade-Tree’ repair project on this motorcycle… not a good thing for my hypertension… I’ll just dig into my emergency fund to pay for any over-priced repair, when and if needed! Obviously with all my experience in changing rear tires I will certainly do that job again if my brand new non-OEM tire ever wears out! Normally I would include digital photographs in an article of this type but the only ones of importance or interest to the reader would be of the insertion of the pencils between the brake pads for the reinstall of the caliper brake and I was so unsure that the technique would work that I didn’t bother to record that process. YouTube videos available online provide more than enough visual support for any assistance for any motorcycle owner out there brave enough to tackle this project. An expensive torque wrench now hangs on a nail in my garage gathering dust…. Oh, Well, another learning experience! Anyone who rides a motorcycle knows that gloves are required, if not to keep the hands comfortable in cooler weather, at least to protect the hands from painful bug strikes on those warmer days. As a motorcycle tourer, someone who takes longer, multi-day trips to visit any and all parts of our beautiful country, the United States of America, I have visited some 32 of the lower 48. It’s not likely that I’ll visit the other 16 since all of them are on the East Coast and the danger of the excessive traffic speed and congested highways prevents an ‘old guy’ from taking that chance. Even out here in the uncontested West the excessive speed on the Interstates continues to be a conundrum. It’s normal to have vehicles at over three digit speed pass (me) on the highway. On an exposed motorcycle vehicles at this speed are more of a danger to a motorcycle rider than to anyone in an enclosed, air bag protected environment of the automobile. But back to gloves! As a tourer, a rider who wants to be comfortable on my rides, I have accumulated what I consider to be variety of pairs of gloves to wear in any and all of the weather conditions that I may encounter during a single ride. The picture below shows five of the six pairs that I routinely pack or wear sometime during a single ride. Not shown is the pair (liners) with built-in heaters used as glove liners in those below or near freezing, winter rides. These are actually insulated work gloves purchased (on sale for $10) at a local hardware store. After wearing them on only one tour I went back to the hardware store and purchased two more pairs for my inventory. While I own ski gloves that cost many times as much as these work gloves the cuffs on the work gloves are great, preventing cold air from entering the cuff of the jacket being worn at the time. When the insulation of the Heavy Insulated gloves is not enough to keep out the cold these liners are worn inside the Heavy Insulted gloves for additional protection. The Heavy Insulated gloves were sized with enough room to allow the liners to be used, when necessary. In those instances where the really cold weather penetrates both pairs my heated liner gloves are substituted for these liners. These gloves are a simple pair of insulated leather gloves and provide a comfortable ride when the temperature is in the mid-range, too warm for the Heavy Insulated and too cold for the uninsulated or mesh gloves. This well worn pair of uninsulated leather gloves are used when full hand protection is necessary even in very warm weather. While the mesh gloves might be preferred at the time those bug-strikes (or raindrops) are much better handled by these gloves. These mesh gloves, while they are actually weight-lifters gloves, are normally worn in warmer weather when a grip not incumbered by sweat on the handlebar grips is absolutely necessary. The mesh allows ventilation to provide some comfort for the hand even on the hottest days. In addition to a variety of gloves that I carry (in my tow-behind trailer) on every tour I also carry several jackets of varying weight. From a heavy weight, insulated (ski) jacket with liner to the HD brand ventilated (but not light-weight) jacket for protection and comfort even on the warmest days. My mid-weight jacket, an unlined, lightweight jacket with loose fitting sleeves and elastic cuffs is one that I wear quite often but have had a problem with the loose fitting sleeves being caught by the wind causing the cuffs to be pulled up my wrist and arm, exposing that portion of my arms from the gloves to the cuff. The result has been an uncomfortable sun / wind burn even on short, one-day rides. I have searched for a solution and believe that I may have found one. The picture below shows a short strip of elastic with a (suspender) clasps attached to each end. This specialty item can be found in the sewing section accessories of most large stores and has a variety of names, mine being called a ‘temporary’ adjustment for fitting clothing. Note that the length of elastic is only three (3) inches. This short length is critical to the fitment / wearing / use of the retainer. The picture below shows the inside of the hand, mesh glove worn, with the retainer clipped onto the cuff of the jacket. It may appear that the clasp is ‘in the way’ but it does not interfere with the grip on the bike handlebar grip. The picture below shows the back of the hand / glove with the clasp attached to the cuff holding it snugly up where it protects the wrist from sun or wind burn. For all those (young) riders out there who might think I’ve gone to the extreme with the cuff-retainer I would point out that protecting my 75 year old skin from the ravages of sun and wind damage is both a necessary and intelligent decision. I’ve also found that wearing a bandanna as a ‘mask’ when wearing a half-helmet on those warmer days has been another ‘intelligent’ decision since the wind and sun burn of my face was an even more uncomfortable situation than on my wrists! Back in March of 2012 I wrote a lengthy article for this Blog about the methods I use to plan a tour on my motorcycle. That article did not contain any pictures of the documents I prepare during that process, so this article hopefully will elaborate on the details of those two documents that I prepare for each tour, as they have evolved from those early designs. My tank bag has a clear vinyl envelope attached to the top with a slide closure, the envelope measuring about 6” x 12” attached to the top of the tank bag (with snap buttons) that I place each of the Way-point lists and associated (Google) trip maps into for a given tour. On my TomTom GPS way-points are called favorites, so favorites and way-points are used interchangeably in the remainder of this document. The picture below shows the top page of several pages that contain the details of each set of way-points for my next tour (to California). The top half of the page is a printout of a spreadsheet containing the details for each of the towns I will travel to/thru (favorites) on the first leg of my next tour. The bottom half is a printout of the Google map with the route highlighted that resulted from my planning the trip for the favorites listed above that map. Using the Google trip planning software provides an easy visual way of determining the mileage between favorites and the highway number of the highway of exit of each of the favorites. The map is not for navigation but simply to give a visual verification of the direction out of each favorite that can be checked against a magnetic compass mounted on the dash of my Spyder. Fuel – The Fuel column contains the cumulative mileage through one or more favorites to that favorite in which I must refuel based on the number of miles that the small fuel tank of my Spyder will safely travel. The total mileage at each fueling city is displayed. I do have a two and a half gallon emergency supply of gasoline in a modified gas container that is stored in the front trunk of the Spyder… hopefully no front end collisions for me! Sheet Number – The second column heading is the numeral of each page of a multi-page set of sheets containing favorites. This trip has eight sheets! The lower case alphabetic characters in this column beside each favorite (city) name is used in conjunction with the page number to cause the list of favorites entered into the GPS to appear in the same sequence as they appear on the spreadsheet. Without this re-sequencing technique the city names would be alphabetic throughout the total trip for all pages of favorites making it difficult to find a favorite (city) name as each favorite on the route is approached. For example, Buena Vista is named “1b-Buena” so it will sort above Poncha Springs which has the prefix “1c-Poncha”. As the trip progresses the favorites already used are deleted so the next favorites to be selected are normally on the first page of the sorted favorites list. Routes – The highway or road numbers of the roads out of a particular city are listed, with multiple road numbers indicating changes in roads between the favorites. This column is used for cross-checking and validation of the route selected by the GPS. Miles – The number of miles between each favorite / city is recorded in this column based on that data provided by the Google mapping software. The cumulative miles is used to determine when the refueling stops are required. The picture below is a closeup of the top half of the first page containing the spread-sheet described above. Note that at the bottom of the Miles column is the total miles number for that set of favorites. The picture below is a somewhat blurred Google map showing the individual favorites and the routes into and out of those favorites / cities. The use of several individual favorites to cause the tour to use the highways / roads desired for the tour rather than a single start and finish for each day establishes complete and total control over the specific highways taken and also individual cities along the desired routes. Letting the GPS use ‘City Centre’ eliminates the necessity of choosing some fictitious street name and street number that was required during the process of setting up favorites of previous GPS models. The owners of the Spyder ST (2013, and newer) should be aware of the possibility that the Belt Guard on the left side (just to the rear and above the passenger foot rest) may come loose, and even totally separate from its bolted on position on the frame of the ST. This happened to me while on a two-day ride to the West of my home in Colorado Springs just a few days ago. I had packed my tow-behind trailer with the necessities for a two-day ride of some 900 miles to the West, then North and then East, returning to my home after touring the Western area of my home state, Colorado. I had checked the air in the tires of the ST and the trailer tires the evening before my departure but did not notice anything unusual, or different around the left side of the rear wheel. The bolts (two) securing the belt guard were probably in place at that moment, or at least one was still holding the belt guard in place else I would likely have noticed it. The belt guard had certainly not fallen down into the belt drive sprocket area of the ST because it would not have survived the eighty mile ride before I discovered something was amiss! Everything seemed normal as I began my ride through / over the front range mountains just to the West of Colorado Springs. I was heading to Hartsel, the first way-point dialed into my GPS. I didn’t actually need the GPS for this leg of my tour but out of habit I always establish a number of way-points (favorites on the TomTom GPS) for all of my trips, especially noting those way-points where I need to fill the small tank of the ST. As I gained altitude the temperature reminded me that I should have worn the heavier jacket that was now inside the tow-behind. I would wait until I arrived at Hartsel before stopping to don than heavier jacket for the trip into the second range of mountains just to the West of Hartsel. Hartsel is a small community just to the West of the valley between the two ranges of mountains just to the West of Colorado Springs. A gas station, a small cafe and a novelties / souvenir store front sit in a group at the intersection of highways 24 and 9, that happen to be at the geographical center of the state. I slowed down to pull off the highway into the gravel and dirt of the shoulder of the road just beyond the gas station. As I did I heard an awful noise coming from underneath the bike, possibly to the rear. It was loud, and likely signaled some really bad mechanical failure. I was not a comfortable rider in that instant. As I slowed to a complete stop and turned off the engine the noise stopped, a good sign that the engine was not involved in whatever malfunction had occurred. I did a walk-around of the bike and tow-behind trailer, not seeing anything hanging down that might be the source of the noise. I got back on the bike, and as I moved forward the growling, unmistakable noise began again. It had to be something around the rear wheel, belt or braking systems to only be causing that noise when the ST was moving! I did a U-Turn onto the highway to get back into the pull-off area at the gas station. As I did I noticed four Harley (Hog) riders pulling off the highway in front of the restaurant. Knowing that these guys probably knew more about motorcycle mechanicals than I ever would (even though a Spyder is NOT a motorcycle!) I decided to ask for help. They were thankfully more than willing to help and quickly determined that there was a belt guard that had come loose and was stuck in the area of the drive sprocket, in an almost unreachable area under the center of the ST. Two of the guys lay down on either side of the ST in the dirt of the shoulder of the road, and after several minutes of struggling they were able to remove a belt guard from where it had lodged itself near the drive sprocket of the bike. A quick roll test confirmed that the noise was gone! Was I ever relieved!!! But, those same Harley guys strongly suggested that I cancel my ride and take the bike to the nearest Can Am dealership to have the drive belt checked… they all agreed that it was too tight and might fail if I continued on my trip. I should add that I offered to buy their breakfast for their help but they graciously refused my offer, simply saying that it was no big deal!!! I programmed Florence into my GPS and headed for that city where the closest Cam Am dealership is located. While I was a bit nervous with that ‘too tight’ drive belt I made the seventy mile trip to Florence, and the dealership, without incident. After a wait of about an hour a Can Am ‘Tech’ was able to check the belt, determining that it was within specification. I learned that the Spyder ST belt is much tighter than other bikes because of the length of the belt. With a fully functional ST I then headed home in the excessive heat of the eastern plain along highway 115 headed North from Florence to Colorado Springs. My trip was over, I had a damaged belt guard in the tow-behind trailer, and I was heading home in the heat of a normal summer day! The belt guard had superficial damage from its adventure with the belt and drive sprocket of the ST but the damage was not severe enough to prevent its functionality on the ST. A few days after I returned home I made short trip to the hardware store to obtain two bolts, washers and self-locking nuts to hold the belt guard in place on the frame of the ST. 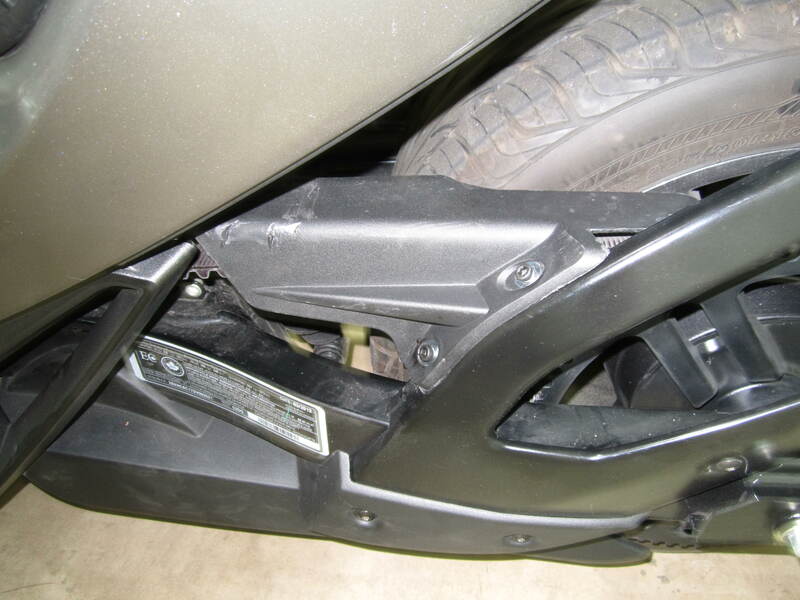 The belt guard bolted to the frame just above the passenger foot rest on the left side of the ST.
A picture of the replaced, damaged belt guard is shown below. Note the damage to the guard caused during the misadventure of a few days ago. I’m still confused about how the bolts / nuts originally used to hold it in place came loose, and fell off the ST. In addition to the self-locking nuts I also used the red Loctite on the threads of the bolts for some added protection against their ever coming loose in the future!